Daytona Beach Shores is a city in Volusia County, Florida, United States. The population was 4,247 at the 2010 census. 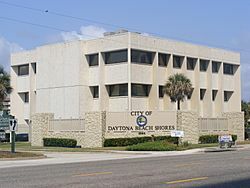 Daytona Beach Shores was first organized in 1960 by local business leaders convinced that a smaller community could provide better services to its residents. The city was incorporated on April 22, 1960. In the 1970s and the 1980s, the city saw a massive building program. Now about 80 percent of the residents live in high-rise condominiums that stretch along the Atlantic Ocean. In 1997, residents voted in a straw ballot to limit the height of future buildings to 12 stories. The city council approved the height limit in 1998. A resort and retirement community built on tourism and the service industry, Daytona Beach Shores has no manufacturing industry, but caters to tourists year-round with miniature golf courses and other types of family entertainment. According to the United States Census Bureau, the city has a total area of 0.90 square miles (2.34 km2), of which 0.90 square miles (2.33 km2) is land and 0.039 square miles (0.1 km2) (3.56%) is water. The city of Daytona Beach Shores is located on a barrier island along the Atlantic Ocean. The other side of the island (the west side) is bordered by the Halifax River lagoon, part of the Intracoastal Waterway. 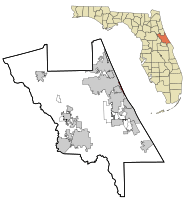 The city is bordered on the north by Daytona Beach and on the south by Wilbur-by-the-Sea, and Port Orange. The major highway that serves the city is State Road A1A/Atlantic Avenue. Daytona Beach Shores has a humid subtropical climate, typical for a city in the southeastern United States. Summers are hot and humid, with highs usually in the 90s and a heat index often exceeding 100 degrees. Thunderstorms are frequent in summer afternoons, and the hot, humid weather can last right through the fall months. Winters are dry and mild, marked by a constant series of cold fronts and warm-ups. Temperatures dip into the low 30s and upper 20s on occasion, and freezes are not uncommon. Frost usually occurs a few times a year, but snowfall is very rare. The last time snow flurries fell on the city of Daytona Beach Shores was in December 2007. Temperatures in spring feature warm afternoons, cool evenings, and far less humidity. This beach-going weather attracts tourists to the beaches, usually by early March. As of the census of 2000, there were 4,299 people, 2,423 households, and 1,439 families residing in the city. The population density was 4,722.2 inhabitants per square mile (1,824.0/km2). There were 4,385 housing units at an average density of 4,816.6 per square mile (1,860.5/km2). The racial makeup of the city was 96.58% White, 0.58% African American, 0.16% Native American, 1.72% Asian, 0.12% Pacific Islander, 0.14% from other races, and 0.70% from two or more races. Hispanic or Latino of any race were 1.07% of the population. There were 2,423 households out of which 4.1% had children under the age of 18 living with them, 54.5% were married couples living together, 3.6% had a female householder with no husband present, and 40.6% were non-families. 35.2% of all households were made up of individuals and 19.7% had someone living alone who was 65 years of age or older. The average household size was 1.77 and the average family size was 2.18. In the city the population was spread out with 4.3% under the age of 18, 2.4% from 18 to 24, 11.5% from 25 to 44, 32.6% from 45 to 64, and 49.2% who were 65 years of age or older. The median age was 65 years. For every 100 females there were 90.1 males. For every 100 females age 18 and over, there were 89.5 males. The median income for a household in the city was $43,796, and the median income for a family was $52,731. Males had a median income of $39,118 versus $24,826 for females. The per capita income for the city was $37,010. About 5.4% of families and 6.8% of the population were below the poverty line, including 6.8% of those under age 18 and 6.0% of those age 65 or over. Daytona Beach Shores, Florida Facts for Kids. Kiddle Encyclopedia.